Sorry for the long absence, but I've been sewing furiously to finish all of my sewing commitments before we move next week. This means I have lots of lovely finishes to show you over the coming days. First up (because it is due today!) is my pillow for round 7 of the Pillow Talk Swap. For those who don't already know, this is a blind swap - meaning that you know who you are making a pillow for, but you don't know who will be making a pillow for yourself. 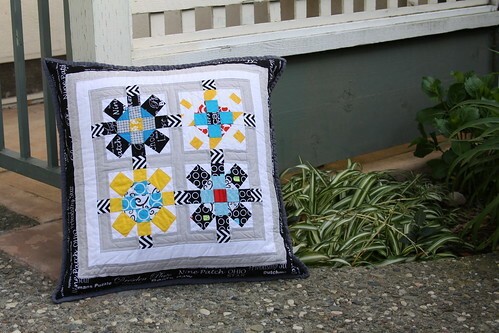 For my partner, I used this block pattern pattern and color scheme from Red Pepper Quilts, and changed it up a bit by changing the color of the background fabric behind the connecting squares, and added a few borders around the whole. Here is the back of the pillow. For some reason these chevrons kind of hurt my eyes in an optical illusion sort of way in my photographs, but I promise they aren't so eye bending in person. This pillow is winging its way off to it's new owner later today. I sure hope he/she likes it, because I sure do! Wow - this is fabulous! Wonderful fabrics and designs! Lucky partner! This is gorgeous. I love everything about it! really cute! 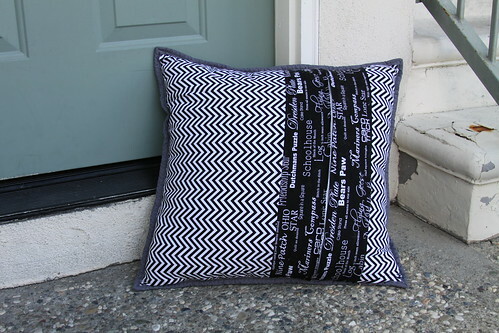 I love all the fun pillows I see during this swap. I've never participated though. Maybe I should, if I had time! I'm sure your partner will love it! Thanks for linking up! Gorgeous! I love that variation on the traditional rolling stone block! You totally should join in! Pillow Talk Swap is always amazing! Playing with us in the online casino, you will get a lot of fun. online slots games Play and win.